Before I begin I have two declarations…firstly, Tom Vincent’s grandfather and my grandfather were brothers, which makes us second cousins. And secondly, this is the first time I’ve written about jazz. 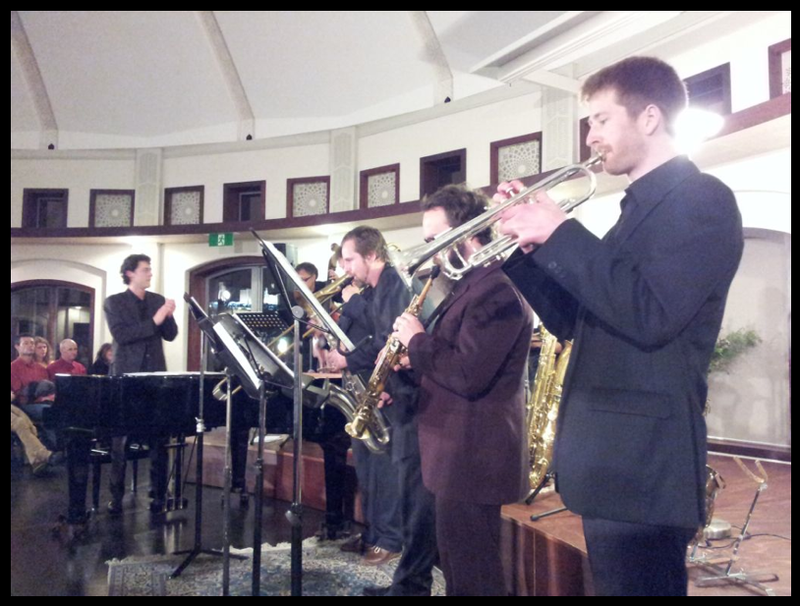 The Tom Vincent Septet Premiere began with Tom clicking his fingers to a full house at the Bahai centre, and the notes flowed from there. We heard a collection of original and arranged works by Tom, including some recognisable pieces by Cole Porter, George Gershwin, Hoagy Carmichael and Duke Ellington. By recognisable, I mean there were certainly moments where I felt a line to the 1960’s, where these old favourites were evocatively and audibly evident, but placed in a bed of notes that defied genre or a particular style. Septet Trombonist Don Bate described Tom’s compositions and arrangements as “Cubist Jazz … where the old tunes had been wacked out and the notes had been totally re-written”. To my ears the music was exciting and had a live quality that went beyond merely being played live in front of us. The notes seemed to dance dart swoop and dive around the incredibly beautiful surrounds of the Bahai Centre. As Tom played, he would stand and sit and stand again, as deftly as his fingers on the keyboard. At one point, as Tom rose from his seat and looked into the grand piano where the lid had been completely removed, it seemed he was actually looking at the notes as the strings played them. At times Tom played very softly and delicately, and at others he wielded the notes and rhythm from the keyboard into a sculpture of sound. In contrast to some previous Tom Vincent Trio gigs I’ve been to, which sometimes went over my head into an intellectual jazz beyond my realm of appreciation, this was not like that. I don’t know if this says more about me as a listener, or more about the music, but this line-up was both complex and deliciously absorbing. A stand out piece was one of Tom’s original compositions ‘Shogoji Blues’, a swing shuffle. Whilst Tom introduced it by talking about his Argentinean Japanese monk friend and their tranquil meeting place in Japan, the piece was far from what would usually be considered ‘tranquil’ and instead was very fast and full of subtle and quirky surprises that made me (and others) laugh out loud. I suppose this says something about the speedy wit and creativity of Tom’s mind. In talking about this piece I have to mention the astonishing solos by Danny Healy and Don Bate. The septet line up was Tom Vincent on piano, Don Bate on trombone, Danny Healy on baritone & tenor sax, Alistair Dobson on alto & soprano sax, Jim Verrall on trumpet, Nick Haywood on double bass and Alf Jackson on drums. All chaps were in snappy suits, some pin-striped and played standing up, except of course the drummer. It was difficult music to negotiate, with exceedingly fast tempos, challenging timing and high notes, but it was all played with such style and accomplishment that the whole sound and experience was fluid, silky, shimmery, throaty. It was not all fast, and at times wafted into dreamy ponderings. Tom’s chats between the numbers were, like his music, very present and impulsive. Testament to this was during a shiny and beautiful trumpet solo when the audience was moved to clap, and Tom stood up with his arms out bird-like conducting the audience with “he’s still going…sssh” and on the solo went. 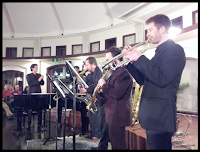 Tom told us at the end of the gig that this was a dream come true, playing his music with this number and calibre of musicians in an amazing place like the Bahai Centre, in Hobart. This gig was one of those where I felt blessed to be there. Wherever that full house of people – the Tom Vincent Septet and the generous and enthusiastic audience – arrived from that day, they came together in excitement and left with a premiere experience. We all became part of the dream. And the dream sounded amazing.